You would think, what is the link between health and Tibolar-RS? It’s scientific proven that the human body needs minerals and micronutrients. And because of the lack of these beneficial minerals and micronutrients in our food, and all its negative side effects, it is neccesarry to get these essential elements in our food. What is the best way to get it in our food? Growing vegetables, herbs and fruit by yourself. Using manure, chemical fertilizers and other efforts to feed the plants makes only the plants grow, but the soil will eventually lose its fertility. And what is to say about the manure which is still applied on the soil these days, with all its contents of anti-biotics the cattle is vaccinated with? Since we started with Tibolar-RS, we have applied it on some fruit trees (cherries, pear, fig), herbs and vegetables. Like with bonsai, the results were also staggering. More blossom on the trees so more fruit. The cherries were bigger in size and the taste was sweeter than average. 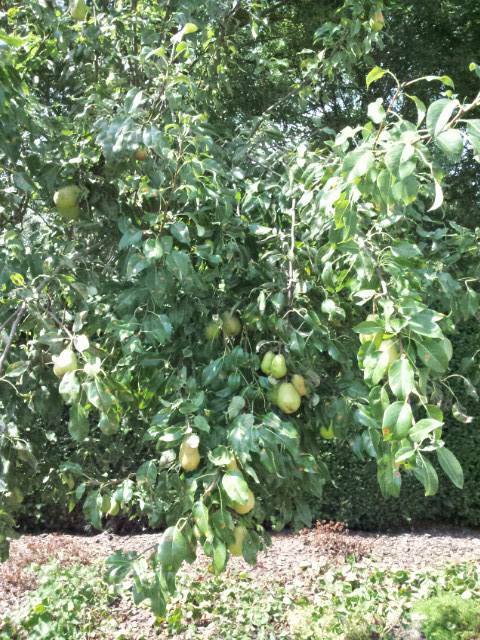 Pear trees had more yield than in former years. On herbs the result were even better than expected. The smell of herbs are very intense and the taste stronger. Increase of leaves on the plant, so more product. Next to the positive effects on fruit and veggies, because of the minerals and micronutrients or trace elements, it also has a very wholesome effect on the human body and health. When we eat the fruit and vegetables which grow on Tibolar-RS we can get the minerals and micro-nutrients in our body. This mineral plays an essential part in Bone health, brain function, anti aging practices, sexual health, preventing cancer, treating Alzheimer’s disease, and reducing muscle pain. This vital mineral also boosts bone health (prevents osteoporosis), relieves arthritis, improves dental heath, and relieves insomnia, menopause, premenstrual syndrome, and cramps. Furthermore, it is important in preventing or treating obesity, colon cancer, acidity, heart diseases, and high blood pressure. This is needed to keep the proper balance of body fluids. It is an essential part of digestive (stomach) juices. Cobalt is one of the vital trace mineral that is known as a constituent of vitamin B12. The body requires a small amount of this mineral in order to conduct its daily grow and maintenance. This common mineral improves brain function, soothes arthritis, helps in skin care, eliminates throat infections, corrects hemoglobin deficiency, prevents heart diseases, and boosts immunity. It is commonly associated with the uptake of iron and the facilitation of a properly functioning circulatory system. This is a key element of hemoglobin formation, body metabolism, muscle activity, anemia, brain function, immunity, insomnia, restless leg syndrome, and the regulation of body temperature. Iron’s primary role in the body is in regards to the formation of hemoglobin, which guarantees circulation of the blood and oxygenation of various organ systems. Without iron, anemia sets in, which is manifested in muscle weakness, fatigue, gastrointestinal disorders, and cognitive malfunction. Potassium can correct low blood sugar, regulate blood pressure, prevent heart diseases, increase water flow in the body, alleviate muscle disorders and cramps, boost brain function, manage diabetes, correct kidney disorders, and manage arthritis. As a vasodilator, it reduces the tension in the blood vessels, and ensures the proper distribution of oxygen to vital organ systems, while protecting against cardiovascular diseases. It has also been shown to boost brain function. Magnesium can treat high blood pressure, heart attack, alcoholism, bone health, cramps, diabetes, menopause, pregnancy, and asthma. It is also very important in terms of lowering anxiety and stress, and has been closely linked to a reduction in anixety and insomnia, due to its enzymatic role in releasing hormones that calm the body and induce sleep. Molybdenum helps your body to maintain a healthy state by breaking down substances in the body, including proteins. Your body needs nitrogen to make proteins in your muscles, skin, blood, hair, nails and DNA. Nickel is another essential trace mineral. It helps other Vitamins, Other Trace Minerals, etc. getting on there place of destiny. Among other effects sulfur makes up vital amino acids used to create protein for cells and tissues and for hormones, enzymes, and antibodies. This mineral is an important player in bone health, skin care, hair care, nail health, sleep disorders, atherosclerosis, tissue development, dental care, and tuberculosis. This mineral is very good at managing Skin care, eczema, acne, healing of wounds, prostate disorders, cold, weight loss, pregnancy, reproduction, hair care, appetite loss, eye care, and night blindness. It is an essential component of more than 10 important enzymatic functions of the body, and without zinc, the body will quickly lose overall function and results in a number of health concerns, including an inability to heal wounds, store insulin, fight off disease, develop proper growth patterns, as well as defend against a variety of skin infections. Because of these positive effects from the minerals and traceelements/micronutrients Tibolar-RS contains, we have now developped especially for fruit and vegetables a new variety of Tibolar-RS.